Fall is almost upon us, when I think of September I think of fall, although, it is usually still hot here! It also means lots and lots of apples. Apple pie, applesauce, apple cider, whatever your little heart desires to do with that apple. I love all apples, all types, so I was very excited when my sister-in-law gave me two grocery sacks full of apples when I saw her last week. She may, or may not have smuggled some from her city park. I don't care where they came from because they are good! One is more of a golden delicious, while the other one is very sweet...not really sure what type it is. I used both in this applesauce over the weekend and it turned out great. We've already eaten through two batches, so I'll probably be making more today! Peel and dice apples, and put into a large pot. Add all ingredients and stir. Place on medium high heat to reach a low boil. 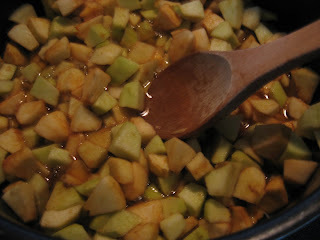 Cook for 15-25 minutes, or until apples are tender. Let cool, then mash with potato masher to your desired consistency. Keep in fridge for up to a week, or freeze for later eating! Not only is this very simple and tasty, but it makes your house smell great! Forget those scented candles or air fresheners, these apples work even better. Only two days left for voting for my Greek Yogurt Pancakes in the Stonyfield Yogurt Recipe Battle! Get a clickin'! This gets me so excited for Fall! It looks incredible! i've never thought to make applesauce. that seems fairly easy and i bet it's a thousand times more delicious than the jarred stuff! MM! I'm on SUCH an apple kick already. You read my mind! Mmmm I can't wait to make this!! I am so excited for all of the fall flavors! I love homemade applesauce. We'll go apple picking in a month or so and get a bunch and I'll be making a ton of applesauce! I make homemade applesauce every year at least twice. Once for my first grade class to celebrate Johnny Appleseed Day and at least once (if not more) for me and Andrew!! :) Sooooooo good. I cannot ever eat store bought applesauce again!! 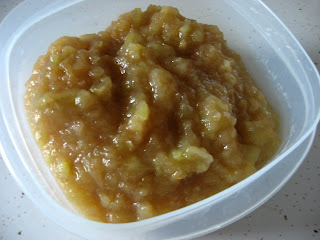 I love making homemade applesauce (and apple butter!) - the best is when you get to pick your own apples! I can not wait for Fall! The food, the clothes, the leaves! Wow, I've never thought of Fall in September - you're early! I usually think abuot it as October b/c that's when my birthday is. We picked apples while I was in NC. We made a bunch of apple pies and snacked on them. Apple sauce is a great idea! Yours looks delicious!! I love apple picking in the fall! Even though Hannah's 18, we still do it every year - I'll have to bookmark your recipe and give it a try. I can only imagine how this makes your house smell. What a great way to use up extra apples. This post makes me so excited for fall! I LOVE the smell of apple spice :). Applesauce always reminds me of fall, lovely! Made a double batch last night for dinner and it was a HUGE hit. So much so, that we hit the farmers' market today to buy enough apples to make another double batch. Now 6 neighborhood kids are hovering in my kitchen asking me when it will be done. I've created monsters! like to find something more safeguarded. Do you have anyy recommendations? Vote for me in Stonyfield Yogurt Recipe Battle! Spiced Granola Muffins & Winner!